Creative conversations… What do creative conversations look like? How can you have more creative conversations? What do you do if your conversation partner is considered an adversary? Brit Poulson and I sat down to discuss these important questions regarding creative conversations. 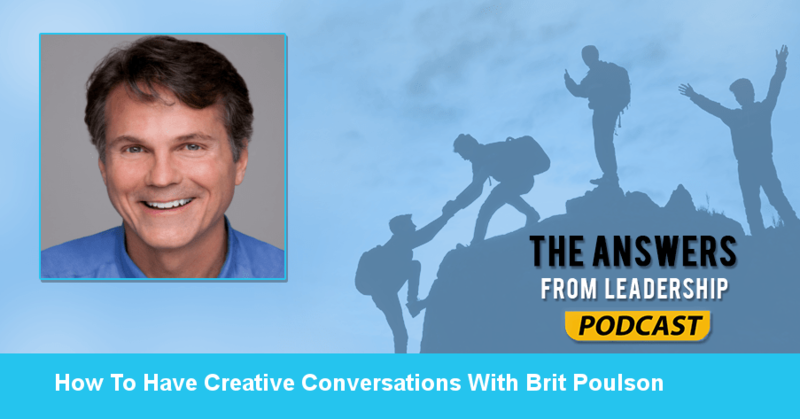 And Brit knows a bit about creative conversations. He’s the author of The Clarity Compass: See More Clearly. Have Creative Conversations. Live the Life you Want. Brit is also the owner and principal of Clarity Compass Consulting where he specializes in transformative coaching and leadership programs. Brit, what else would you like listeners to know about you? I’d like them to know that even though I’m doing business work and leadership consulting work, my overall approach is a psychological approach. I start on the cognitive level and then work down to deep understandings of the world. And how would you define leadership? I’d define leadership as making a significant difference that wouldn’t have been there otherwise. One of the benefits readers of The Clarity Compass should walk away with is the ability to have more creative conversations. What is a creative conversation? A creative conversation is one where you’re actually opening up the possibilities. We come into conversations with specific outcomes in mind. Creative conversations open a third conversation. Why is a creative conversation important? The reason creative conversations is because the other conversations have us stuck at me and you. Creative conversations has us come together and think of new possibilities. How can a leader have a creative conversation? A lot of The Clarity Compass is based on 2 polarities. Intentions to action and facts vs. stories. We’re in an exploration rather than a dicotomy. Can you have a creative conversation if you view the other party as an adversary? As soon as you’re viewing them as an adversary, you’re already out of a creative conversation. A creative conversation is an invitation to see them as a collaborator. Do you have any tips on getting out of the adversary mindset? A here and now conversation is “Hey, how’s it going right now?” Point to the conversation that’s happening right now. What’s something a leader should be looking for when he’s having a creative conversation? Two sides. Emotional intelligence is two parts. Being aware of myself and managing myself. As well as being aware of you and trying to collaborate with you. Having awareness around that conversation and how open am I being? And then how open is the other person? If you notice your conversation partner getting more defensive, how would you guide them into a creative conversation? Coming back to the here and now conversation… Which is noticing what is happening. I’m noticing the conversation is speeding up. Noticing whether or not we’re making process. Then asking how we can slow the conversation down. Ask what’s the purpose? What’s one thing you wish you would have known about leadership in your 20’s? It’s funny because I was working for Dale Carnegie courses when I was in my 20’s. But there’s something about gravitas. It’s really leading from within rather than managing everything out there. That’s a big piece I missed in my 20’s. If a listener wants to connect with you, how can they connect? You can go to claritycompassbook.com. Ultimately, I’m inviting people to greater depth and richness. Really to a place of heart. Did you find the conversation about Creative Conversations valuable? If so, I highly recommend you purchase Brit’s book The Clarity Compass. He dives deeper into this topic and how to pinpoint your blindspots. The Clarity Compass will help you increase your leadership and relational abilities. Purchase The Clarity Compass on Amazon by clicking HERE. Today’s Answers From Leadership podcast sponsor is Audible.com. They’re offering a free 30-day trial and free audiobook for listeners of Answers From Leadership. With their selection of great audio books, you’ll be able to find a book to choose as your free audio book.